At the Adams Museum, you’ll find some of Deadwood’s greatest treasures and cultural artifacts. From fossils of a plesiosaur to cryptic notes about the discovery of gold in the Black Hills to original sketches of Wild West Icons like Bill Hickok, this museum is sure to please everyone in your group. The museum is open year round and is very affordable. 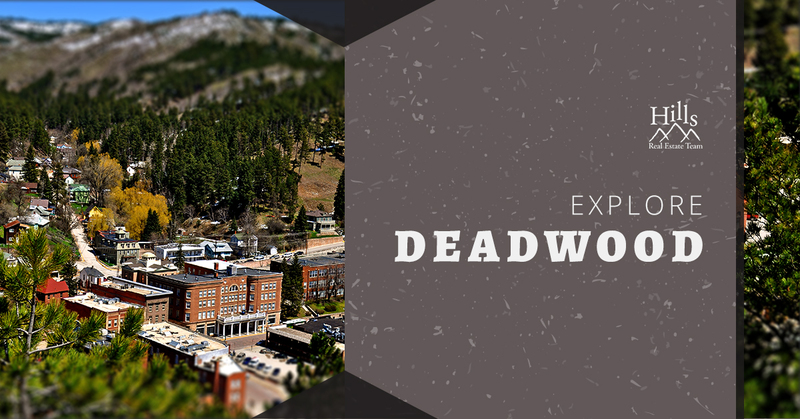 You’ll love getting to know the history of Deadwood in this fun institution! For more than 70 years, the Black Hills Playhouse has been presenting the best in live performances in Deadwood. The performance calendar is packed each year with comedies, musicals, mystery shows, and so much more. With an ever-changing cast of characters and performances, you’ll never run out of things to see! Make sure to check out their performance calendar! There’s no better way to get to know a town than by taking a long walk. For a great way to learn about Deadwood’s rough-and-tumble past, as well as the National Historic Landmark within the town, take a walking tour! Lead by costumed guides, you’ll find out more about Deadwood’s days as a mineral boomtown, its relationship with brothels and bars, and the process of reinvention that Deadwood has undergone in the face of natural disaster. Just outside of the modern luxuries of Deadwood lies pristine wilderness. Get a taste of the wild side of South Dakota at Custer State Park. Sprawling across more than 70,000 acres of untouched land, Custer State Park is the best place to enjoy camping, hiking, biking, and swimming in nature. With diverse wildlife, striking vistas, and so much more, there’s something for everyone at Custer State Park. One of the most remarkable natural geological features in the Black Hills is undoubtedly Devils Tower. Not far from Deadwood, this incredible National Monument hosts educational talks, Native American celebrations, and even recreational climbing. Notable for being America’s first National Monument, this natural and cultural spectacle can be witnessed year-round and is maintained by the National Park Service. Nestled on top of a mountain plateau, surveying the city of Deadwood below, Mount Moriah Cemetery is home to some of the town’s most famous, and infamous, characters. Heroes, cowards, conmen, and lawmen alike all rest here. This beautiful Victorian style cemetery offers a great chance to step back in time and pay your respects to the people who helped found this town in the Black Hills. The park has had its walkways redone recently, making it easy to spend the afternoon strolling through the cemetery, just as our Victorian counterparts would have. A fixture of any Wild West town was the saloon. Here in Deadwood resides one of the most famous in all of Western Lore. The Saloon #10 is said to be where it all started, and where it still happens even today. Wild Bill Hickok took his last breath in this saloon, and a rogues gallery of characters have passed through the doors. Enjoy historical reenactments, nightly live music, gambling, and the state’s largest selection of whiskey while you’re here. Mammoths were some of the largest land mammals to ever exist, so it seems only natural that they’d need a large research facility dedicated to them. At the Mammoth Site near Deadwood, you’ll find the largest concentration of Columbian and woolly mammoths ever found in context. Your ticket includes a 30-minute tour of the bone bed, access to the expansive exhibit hall, and even a view of the laboratory where the fossils are prepared and treated. The Buffalo Bodega Gaming Complex is a full-service casino, featuring standards like gaming, fine dining, a selection of choice beverages, and live entertainment. Cleverly blending timeless Wild West style with the best in modern entertainment, the Buffalo Bodega is in the very heart of Deadwood, making it a natural gathering place on your fun night out. Founded in 1877, this casino has been a Deadwood favorite for more than a century and continues to inspire and delight even today. A quick stop by Deadwood’s first and finest hotel is like a step back in time. Considered to be the Jewel of Deadwood, the Bullock Hotel is resplendent in its Victorian-era beauty which has been maintained with care in the more than 100 years since its opening. But behind the glimmering facade lies a grim past, making it one of the most haunted buildings in the town. It’s told that the ghost of Seth Bullock, the first Sheriff of Lawrence County, still roams the halls of the hotel. You can book a night to stay at this historic hotel, or simply take a ghost tour of the building which is a fun way to learn about the history of the lawmen of Deadwood.